The Bratva. So, you remember that promise Ollie made to go to Russia at the end of last season’s flashbacks? Well I don’t, because apparently he did, because we find him in Russia in an underground fight ring. And he’s doing well in the way that unlike his opponents he’s not dead, but he is not closer to his target: a crime boss named Konstantin Kovar. He gets captured after his latest win and is met by a familiar face: Anatoly, who escaped Lian Yu in season two, and is now a captain in the Russian mob (the Bratva). When Ollie discusses why he’s here (and gets a lesson on how to escape ties from Anatoly that will probably be important later), Anatoly says getting to Kovar is impossible, but a way in may be in becoming Bratva. And that way has a first test involving surviving getting jumped in by several guys. Ollie will do fine. Balancing Anarchy and Order. In the present, Mayor Oliver Queen is due at a policeman’s gala…but is currently fighting a massive bomb wielding Anarchy! After putting ol’ Lonnie to sleep for the cops to collect, Felicity is remotely disarming the bomb, or trying to if that odd vigilante in a hockey mask wasn’t trying to do the same! Ollie’s having none of this guy, who we learn is called is called Wild Dog, and kicks him aside so Felicity can finish her job. After she does, Ollie decides to encourage Wild Dog to stop doing his thing by putting an arrow through his leg. And as we know, getting shot in the leg by Ollie is pretty much a job audition for the Team, which is only Ollie, Felicity, and Curtis now. Ollie makes it back to the gala in time to discuss his plans to focus on police corruption, which at a POLICE gala is a bad idea, and his mayoral assistant (?) Thea is happy to point that out. But Ollie is more pragmatic about his role, being that he’s an okay mayor, but really this is a chance to get ahead of dealing with crime in the city, both on the streets and in the police. Speaking of dirty cops, across town some dirty cops are taking over a drug lab for their own greed, but get interrupted by a gang led by Tobias Church (or you may recognize him as Tyrese from The Walking Dead). Church decides to show who’s boss by taking out some brass knuckles and beating the lead crooked cop to death. So yeah, I guess he’s the boss. Dirty Badges. After avoiding Felicity suggesting putting together a new Team since the old one doesn’t look like its getting back together anytime soon, Ollie surveys the now crime scene at the drug lab. The cops discuss maybe there wouldn’t be this kind of trouble with police corruption if Quentin Lance was still a cop. Well, where is he, anyway? As it turns out, Ollie visits his place and finds he’s been back in town for a few weeks, not involved with Donna anymore and back to drinking. Ollie wants Quentin to help him out, but he’s not interested, and really not wanting to go to the dedication ceremony of a statue for Laurel. 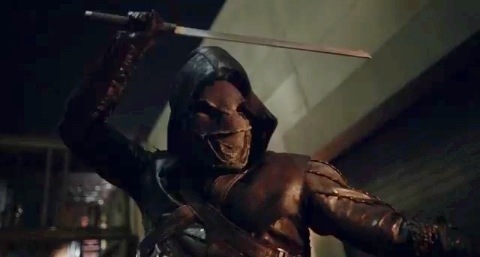 But, Quentin decides to go anyway, catching Ollie’s speech as the Laurel as Black Canary statue is revealed. That ceremony gets interrupted by some heavily armed goons who kidnap Ollie and several city council people, all because Church wants to kill the Green Arrow, and thinks taking the mayor as bait to lure him out will work. Good news Church doesn’t know: he does have the Green Arrow! Bait/Catch. So the Team (as it is), tries to locate Ollie and the other hostages, while Thea being the only person available to take the baddies on, is having some doubts. She is actually enjoying not being Speedy, and not inclined to gear up again, even though she will have to. Meanwhile, as the Team finds where the hostages are, at that same place, Ollie gets to mouthing off on Church about his plan to kill the Green Arrow. So Ollie gets dragged away from the hostages to get beat down by one of Church’s men. Once there, Ollie uses that little trick Anatoly taught him to break loose, and in a callback to the very first episode, snaps the guy’s neck, saying “no one can know (his) secret”. Thea arrives in time and helps Ollie get out, but thanks to a bomb rig around the hostages, have to leave empty handed. And oh, Ollie kills a few more guys, which Thea gets to see. I wonder what she’ll think of that? Yeah, put the statue out by a pier, just in case you want it disposed of later. Kill Point. Thea is really not cool with Ollie deciding to just go randomly kill baddies again, and doesn’t want to go back out there again as Speedy with that. Felicity suggests that this might be the best time to get help by recruitment some of the vigilantes that popped up, like Wild Dog, to help get the hostages out. Just in case Ollie changes his mind, she sends Curtis out to find more on Wild Dog. What he finds is him getting mugged, but more on that later. Ollie meets up with Quentin to see what to do about the hostages, and Quentin offers a solution: a small group of cops loyal to Quentin and willing to go the extra mile to help the Green Arrow, no questions asked. Also, we learn something else we didn’t know from last season: mainly what Laurel told Ollie before she died. What she said was not to let her be the last Black Canary, kind of like a memorial to her. Well, um, does a statue count? The Substitutes. Ollie and Quentin’s cop Team break into Church’s warehouse and start retrieving the hostages, and wouldn’t you know it, the place is rigged to blow. The cops get the hostages out, and Ollie leaves out a window…and hooks himself with an arrow to Church’s escape copter as the place explodes! Ollie and Church fight, but Ollie gets knocked off the chopper, and pulls out a…PARACHUTE ARROW? !…to avoid falling to his death. Afterwards, Ollie realizes that maybe putting together a new Team might be a good idea after all, and an injured Curtis post-mugging wants to sign up. Nope, totally not Malcolm Merlyn. But…probably is. Rebuilding. Ollie has a press conference where he honors the cops who saved the hostages, which is a cherry on top of his plummeting approval ratings finally going back on the upswing again. Later, he calls Diggle, who’s stationed out of the country somewhere, and talks about his plan to build a new Team, and what that means for him and Felicity. Well, we know something he doesn’t, in that she seems to have a boyfriend now! 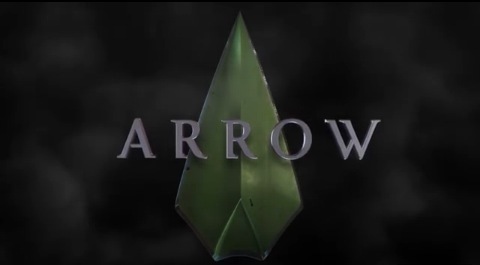 We’ll see how this season’s potential Boyfriend/Victim on Arrow goes. 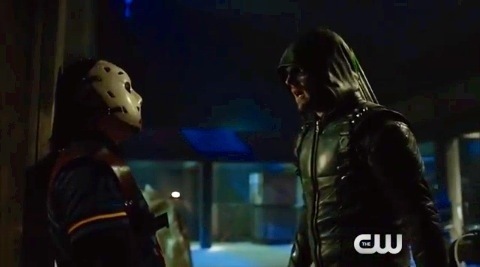 But far more troubling is one of those hero cops getting attacked by a masked assassin who is absolutely not Malcolm Merlyn, except let’s all be honest, who is it other than Malcolm Merlyn? So yeah, has to be Malcolm Merlyn. But maybe we’ll find out next time. –Comic book connections: Wild Dog is pretty close to the DCU vigilante character created in the 80’s as that universe’s answer to Marvel’s The Punisher. –There’s some badass moments for Ollie here, like that midair shot into the chopper, and him tagging the bomb with an arrow for Felicity to plug in, that he fires in mid-flip. –So as far as we can see, none of the time altering stuff that happened in this week’s return of The Flash has affected anyone here, or at least, not in a noticeable way yet. –Look, its just odd I’ll be recapping two shows with Chad L. Coleman (Tobias Church) this year, this one and The Expanse when it returns later this year.